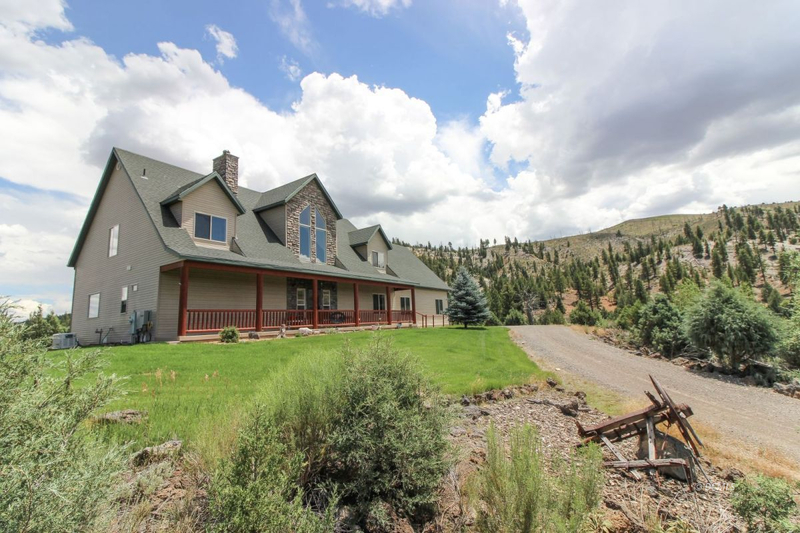 Fly Fishing Dream - 9.83 acres The river runs through your property. Unlimited wildlife - Catch fresh trout before breakfast right out your door. 3,356 sq ft home is beautifully constructed and located. 4 bed, 3 full bath, attached three stall garage, covered decks front & back, high vaulted ceilings, rock accents, wood floors and of course FULL CREEK ACCESS. The features are boundless! A detached, 3 stall, pull through garage with large bay in middle is essential to the mountain life style. Property includes RV parking with full hook ups and dump for sewage. State of the art kitchen has 5 burner gas range, electric oven, wooden cabinets, newly installed dishwasher and a sweeping counter to prepare food. Main living area ties in nicely to main floor master bedroom and massive attached master bath with walk in closet, dual headed shower with steam bath capabilities and a dual sink. The upper open loft offers great living space and unmatched river views. Railing Bannister & wooden mantel above pellet stove are hand crafted from cedar harvested on the property. Finish 32x18 Bonus Room adding 576 sq.ft. living space. A riverside retreat that is often sought after but seldom found.